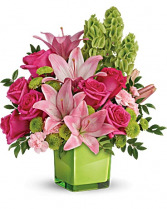 Surprise them with beautiful blooms - a cute, compact bouquet of hot pink roses, button mums, and pink day lilies. 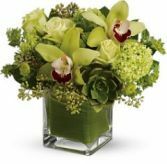 They'll be dazzled by this classic, yet contemporary gift - and impressed by your impeccable taste. 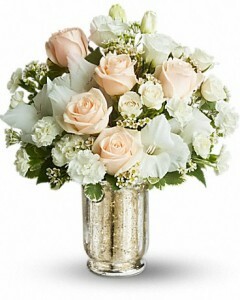 Artfully designed flowers in a pretty glass vase. 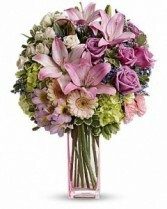 Featuring a premium arrangement of gorgeous purple roses, pink lilies, pink gerbera daisies, hydrangea, and sweetheart roses.